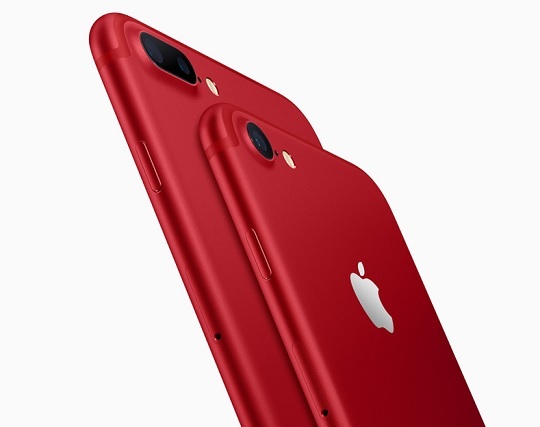 Apple today added a new color option to its iPhone 7 and 7 Plus lineup in the form of the new (PRODUCT) RED Special Edition units that come in a vibrant red aluminum finish. The decision to launch a unit with a red shade comes from the celebration of Apple and (RED)'s partnership for 10 years. (RED) is a company that raises awareness and funds to help eliminate HIV/AIDS in Africa. The partnership allows customers to contribute to the Global Fund and bring the world a step closer to an AIDS-free generation. Since it was founded in 2006, (RED) has generated more than USD465 million for the Global Fund, with more than USD130 million coming from Apple alone. Apple's new iPhone 7 and 7 Plus special edition units in red color are joining those with jet black, black, silver, gold, and rose gold finishes. Beginning Friday, March 24, the special edition PRODUCT(RED) iPhone 7 and 7 Plus units will be available to order online and at Apple Stores, Apple Authorized Resellers, and select carriers worldwide. Product shipments will start by the end of March. Both the iPhone 7 and 7 Plus special edition will come in 128GB and 256GB variants with a price starting at USD749 or about Php37.5K in direct peso conversion.